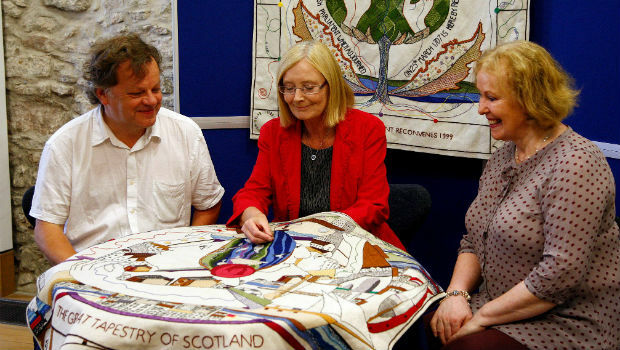 Tricia Marwick, the Presiding Officer of the Scottish Parliament and MSP for Mid Fife and Glenrothes has sewn the final stitch on the last panel of the Great Scottish Tapestry. The tapestry chronicles Scotland’s history from when it was land locked with ice, right through to the re-convening of the Scottish Parliament in 1999. Over 1,000 stitchers have been involved in the project, which has seen the stitching of 143 metres of tapestry. The project was the brainchild of Scottish writer Alexander McCall Smith, artist Andrew Crummy and historian Alistair Moffat and it is one of the most ambitious community arts projects in the World. The tapestry was made with 300 miles worth of wool and consists of 160 separate panels. Mrs Marwick said: “I am delighted to be adding the final stitch today and I look forward to seeing all 160 panels exhibited together for the first time in the Parliament later this year. “This has been a mammoth undertaking and I want to thank all those that have worked so tirelessly to bring this project to life. “Their hard work and imagination has resulted in a truly breathtaking piece of art which generations will enjoy for years to come.